"In this astrakhan cap and enormous dark blue cloak held together by delicate metal clasps, he appeared to Parisians like a gorgeous and gigantic Magyar." For all its outlandish costume (compare some of Rembrandt's self-portraits) the picture has about it an air of dignity and repose, and a simplicity, that contrasts with the intensity and bravado, or alternately the irony and suffering found in most of the self-portraits. The canvas is inscribed to Charles Morice, to whom Gauguin presented it. During his Tahiti stay he had accused Morice of having kept back moneys owed him, but they were reconciled in October, 1893. 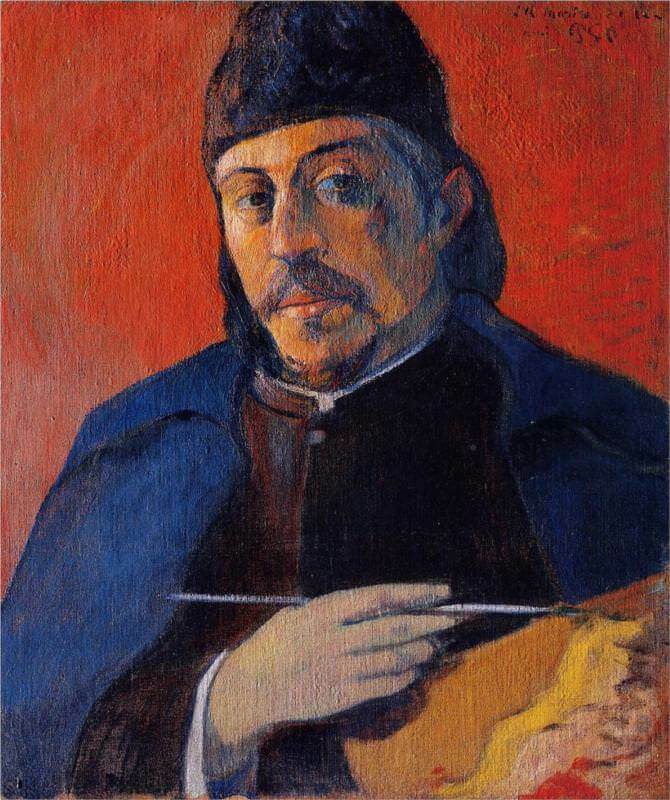 Morice then wrote the preface for the November, 1893 exhibition which Degas persuaded Durand-Ruel to present. In 1894 Gauguin and Morice began their joint work, Noa Noa.